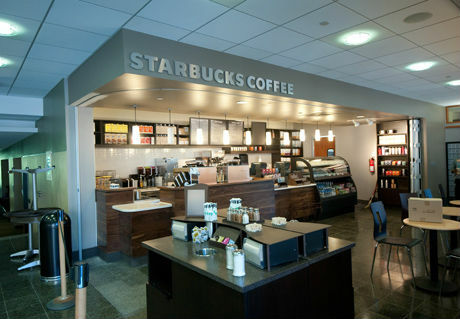 With each passing week it looks like Starbucks is becoming America’s largest office space broker. Overpriced coffee, underpriced work room. I’m in Florida now, but when I lived in New York City it wasn’t uncommon to see an entire store filled with people working on their laptops shoulder-to-shoulder. If you’re one of the millions of people who spends 4+ hours a week punching away at your keyboard while sipping domed drinks, use this as a primer to avoid the nutritional boobie traps that await you at Starbucks (and in most coffee shops). Because believe me, they’re there. For this article we’re going to skip the canned drinks you can buy. You can just read the labels. 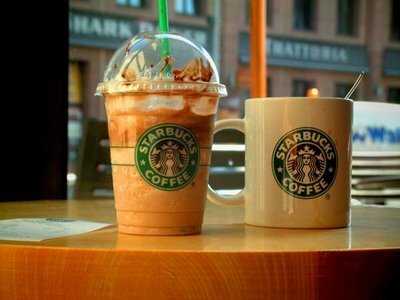 If you want to be a Starbucks Junkie and keep your figure, it’s generally best to stick to these drinks. Where things get complicated is the drinks with long names, milk ingredients, and different flavors. With these drinks caloric content can range anywhere from 80 to 500 calories depending on size, flavor, and type of drink. I’m no coffee snob and am frequently confused by the byzantine menu options offered. I don’t know the difference between a mocha and macchiato. For me, trying to memorize the menu is futile, but I’ve found you can use a few simple rules that are good guides for determining the relative caloric content of different menu items. Cappuccinos, macchiatos, and caffe’s typically have between 80-120 calories in them, and you often have the choice of ordering a drink with the suffix latte or mocha. Now let’s look at flavors. We can also see that mixing flavors causes calories to go up in a stepwise manner. 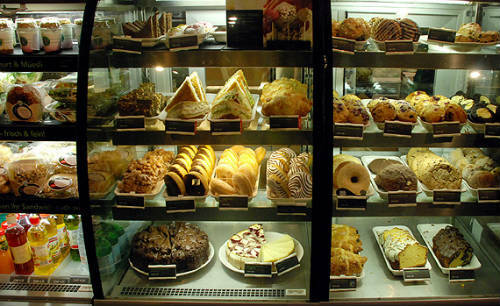 For some reason many people have the impression that food served in coffee shops is good for you. Nothing could be further from the truth. Most of it’s high calorie crap. For the most part, none of the food options have any nutritional value, so it’s best to think about what foods you’d be best off to avoid. And if you don’t go that route, it’s best to order treats that are light in weight. Rice Krispie treats work best. Things get a little better here. There’s less variation in caloric density, and because the menu choices contain ingredients besides sugar, flour, and butter you actually have a shot at doing something good for your body. You’ll want to pay more attention to what goes on inside the sandwich, and not the bread choice. 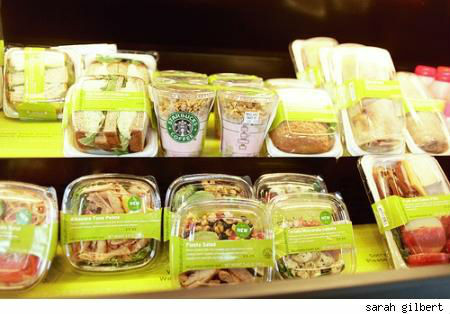 Despite its chic persona, Starbucks doesn’t have a lot of great menu options for the light eater. The only benefit I find to eating there is that the paucity of hearty, healthy menu options often causes me to forsake eating there altogether and just eat at home when I’m done with my work. Great article! Up here in BC, Canada we have a blueberry oat bar that I used to eat mindlessly at Starbucks believing (naively) that if there were blueberries in it it must be lower in cals than other bars. Well the whole square (and not that big a square) was 480 – you could have knocked me over with a feather. One thing I would suggest for eating at Starbucks is to go with a biscotti – they’re typically 160-190 depending on the flavour (vanilla almond is the lowest and my favourite flavour anyway!) or their packaged shortbread biscuits, especially the Owl and Pussycat Vanilla Biscuits. haha you feel a bit like a kid eating them but they satisfy a sweet tooth for 120 cals. Can’t go wrong with that! Thanks Anna! I’ve always found that in “chic” places it’s very easy for certain packaged foods to brand themselves as healthy, but when you look under the hood, things are not at all what they seem. Good call on the biscotti. I know down here in the US they’ve also added fruit and veggie puree packets which are a good bet, as well as fruit bowls….but they’re also filled with peanut butter and sugary yogurt.